Matt Gangemi is a mechanical engineer. He has commuted by carpool, bus, bike, scooter, feet, Monorail, and once by snowshoe. At 10km (3 lines), it would be tied with the Newark Light Rail as one of America’s shortest American rapid transit lines. The city is planning to expand from 3 gondola lines to 10. Which sparked an idea to bring a gondola to our Georgetown in this Washington. The Georgetown neighborhood in Seattle is a bit rough, but has many of the right components for a walkable center – small slow crocked streets, retail with narrow storefronts, a community college, breweries, interesting historic sites, and a chocolate factory. So here’s the idea. Run a gondola from Georgetown to Othello Station, with a stop at the main entrance to Boeing Field and a stop at Van Asselt Community Center on top of Beacon Hill. This would give our city easier access to Georgetown, it would connect Boeing Field with Seatac by transit, and would give Beacon Hill residents a new route down to Link. This of course is just one of many east<–>west connections we can make in Seattle that could make sense. It looks like Bogota may copy Medellin’s concept of putting community amenities at gondola stations. These include libraries, community centers, police stations, medical clinics, theaters and other community amenities that the neighborhoods needed anyway. Although this adds* to the apparent cost of a gondola line, it spreads out the reach of these community resources, and gives some cost savings in combining two projects into one. I think a similar strategy would be a great idea for the Queen Anne – SLU – Capitol Hill line. The Capitol Hill station would connect to a light rail station and the Queen Anne station would land in one of Seattle’s largest amenities. But South Lake Union is a new and quickly growing neighborhood without any amenities at all. 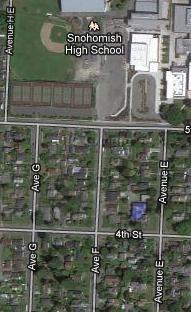 It could use a school, a library, or a community center. And I should add that this strategy could also be useful for other forms of transit. It would have been nice to add something on top of the Beacon Hill station, for example. 1. Love the streetcars on the Embarcadero. Old, beautiful, and every one is packed. Unless there’s some bottleneck in capacity they need more. They were somewhat infrequent, which is strange when trolleys are leaving passengers on the curb. 2. Ditto cable cars. But I’m sure if they could add cars to the line they would. 3. Found myself being a change fumbler on the streetcar. Didn’t have enough change ($2.25), so I put in a $5. The bus driver said I way overpaid and should have asked her first (not clear what she could have done – sign says “exact change”). Gave me two transfers – as if that helps me. Lesson: at least for tourists, cash payment can be good. I paid more than double (happy to do so), and didn’t actually cost any time (stood aside while I figured this out). 4. After I paid my $5, a woman behind me handed me a handfull of change and asked me to pay it and get her a transfer. Dropped it in the slot and it was $0.47. Driver asked who did that and passenger just looked down until another passenger pointed her out. Then she asked for a transfer and the driver said “not for $0.47!” Lesson: yeah, stuff like that happens everywhere. 5. Bike share! Because my family was on the streetcar I had just missed, I thought I’d rent a bike (rack is at the station) and try to catch up. It was $9, but would have been worth it for the experience. After having to press countless buttons including my phone number, zipcode, etc (all on an unresponsive touchscreen) the next streetcar was approaching and I cancelled out (which still took 3 unresponsive button presses). Lessons: Price not competitive, user interface needs a lot of work and lost me as a customer. For every gondola idea I’ve posted here I’ve been careful not to plan a line in the same place where it would make sense to build rail. A subway is more permanent, faster*, and generally has much more capacity than gondolas. Yes, gondolas are potentially much cheaper, but cost shouldn’t trump good design if we can afford it. Because of this, I think gondolas are best run as feeder branches to a subway system, or on its own in areas that doesn’t make sense for rail. 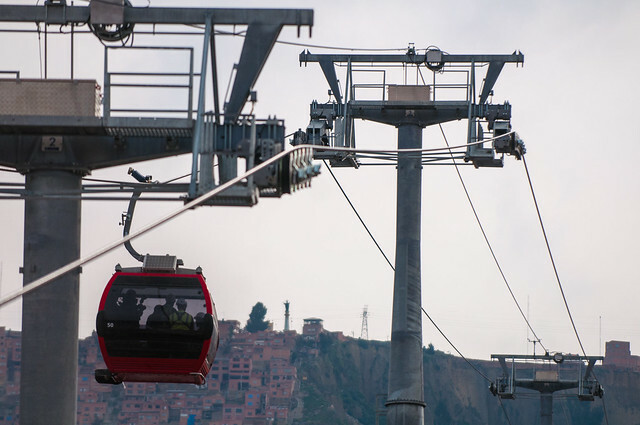 This said, I would like to call your attention to the city of La Paz Bolivia, and its first gondola line, Línea Roja. 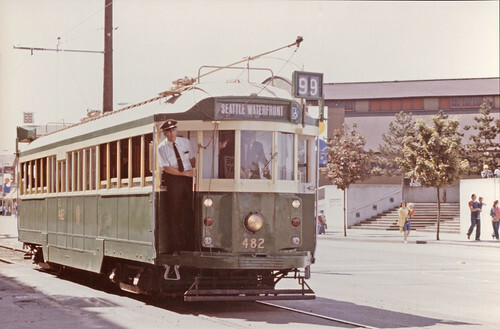 In their opening month they served 1,000,000 passengers, or around 36,000 riders per day. This is well beyond Seattle’s Central Link’s opening numbers, and it took Link over 5 years to reach one million riders in a month. La Paz is on course to build a total of 8 lines. Of course there are a dozen reasons this line isn’t comparable to Link, or anything we would build in Seattle. And it hasn’t changed my opinion that gondolas belong mainly as branch feeder lines if we can afford real grade-separated rail. But occasionally the issue of capacity comes up, and I think La Paz shows we don’t have to worry about it. Boeing Field no longer looks like the best use of land. Living in the Seattle area means having access to nature, even by bus. There are blueberry farms you can ride to, hiking trails, and recently I discovered a campground with a bus stop at the entrance. 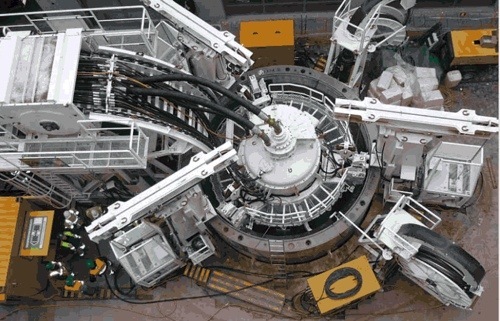 Girona, Spain – Shaft excavation under extremely confined conditions. 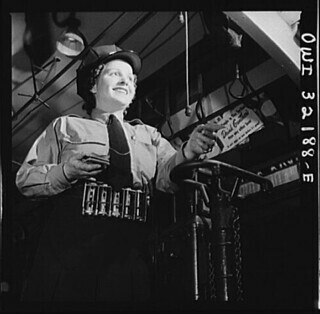 The Ballard shaft was only 9 meters wide, but could such a technology be used for building subway tunnels? The shaft built to reach the Beacon Hill station was 15 meters wide. Sebastian Berblinger of Herrenknecht, the maker of King County’s VSM, says that they currently build 16 meter wide VSM’s and have plans for up to 33 meter VSMs in the research and development stage. Sebastian tells me that a 16 meter wide VSM can generally build an 85 meter deep shaft, which would more than cover the depth we’d need for a Queen Anne station (Uptown has an elevation of around 43 meters, and the top of the Counterbalance is around 114 meters). And it could build it fast – up to 5 meters deep per work shift. VSMs have been used to build subway lines in Italy, Russia, and a high speed rail line in Spain. Of course there would be other technical issues with a deep subway station such as elevator speed and capacity. But it’s encouraging that this new technology has the potential to make the physical depth of construction a smaller problem. First there was Zipcar*, offering a membership-based car sharing service with cars distributed throughout the city. Then came Car2Go, as a one-way, park-most-anywhere complement to Zipcar’s service. Add in bicycles, regular taxis, all of the taxi alternatives (Uber, Lyft, Sidecar), our extensive bus system, streetcars, a monorail, and our light rail system, and there are real alternatives to car ownership in Seattle. Rental cars have always been an option as well, but with their typically slow checkout systems it’s been hard to justify renting one for less than a 24 hours. Enter Hertz 24/7. The newest car-sharing strategy has started small** and without fanfare in April of this year in Seattle, though they’ve had some version of the service since 2008 in some cities and college campuses. There are currently only seven cars in the Seattle area, spread among five Hertz locations, and one car at the Auburn airport. Like Zipcar, they’re round-trip rentals, they charge by the hour or day, there’s an app to find and reserve a car, and you use a key fob to rent your car without any paperwork. Unlike Zipcar there’s no membership fee, but they aren’t parked in neighborhoods – you have to visit a Hertz location. The five available cars currently run between $9.59 and $12.78 per hour on a weekday depending on the car. Daily rentals currently start at $71.89 – a price that actually beats the cheapest traditional daily rental from the same lot ($84.37 after tax). One interesting aspect of Hertz 24/7 is that in New York City they have one-way rentals to airports. Hertz tells me they will offer this in Seattle in the future. Considering the cars start at around $9 an hour this can be a very convenient choice for frequent flyers that don’t live near Link. One odd piece of their marketing strategy is that “Hertz is taking the lead in installing ‘on demand’ technology in its entire fleet with its Hertz 24/7 service, thus bringing the car sharing/hourly rental option out of urban environments and into the suburbs.” First, I’d think suburban car sharing might be limited in usefulness based on the difficulty of accessing a car without good transit. Second, there aren’t any cars available outside of Seattle or airport locations in the Seattle area. ** And by “small” I mean very small – out of the 35,000 vehicles they equipped for this service, the Seattle ended up with 7, plus one at the Auburn airport. Hertz tells me this will increase and maybe we’ll get a larger share of the 500,000 vehicles they plan to have available by 2016. Tomorrow is election day. So finish your ballot and mail it in. STB’s endorsements for the primary are here and here. Double required parking from 1 space per 8 micros (up to 8 micros per “unit”) to 1 parking space per 4 micros. New requirement for bike parking: 1 space per 4 micros. Potentially adding design review by setting design review levels based on square footage rather than number of units. This fourth point is particularly strange. Single family homes presumably will still be able to rent out up to 8 rooms, as currently allowed by code. Therefore it appears to only outlaw adding bathrooms to single family homes. The trouble of course is deciding what is a micro and what is just a bedroom with a bathroom. They do add a requirement that “micro dwelling units are to be indicated and noted on plans and permits”, which seems to leave it up to the developer whether you’re building a micro-unit or just a bedroom with a bathroom. I understand DPD’s desire to keep control over this new building style, but the best way to make micro-housing affordable is to keep regulations light. Adding parking and design review will add cost to these projects, which will result in fewer units being built. Breaking: Study finds that buses are cheaper to run on the waterfront than streetcars. Metro not asked whether bus route 99 was a hit, or whether electric buses would be quickly value engineered into regular diesels. Waterfront Seattle, Parametrix, and LTK Engineering Services have produced a set of documents that provide a detailed analysis of what it would take to reinstate the Benson Waterfront Trolley as well as a complete comparison of two classic trolley options, a modern streetcar option, and two bus options. They started last year, and plan to have their system running in 2015. They’ll have 13 stations, 8 miles of travel, and expect 250,000 passengers per day at opening with a full capacity of over a million passengers per day. It will be a privately funded system, paying for itself with farebox recovery. Because of poor power reliability in Nigeria they’ll build two redundant generators at each station that needs power. They’ll have cameras and intercoms in each of the 300 cabins. The total cost of the system will be $500M, and fares will be between $1.28 and $1.92 per trip. 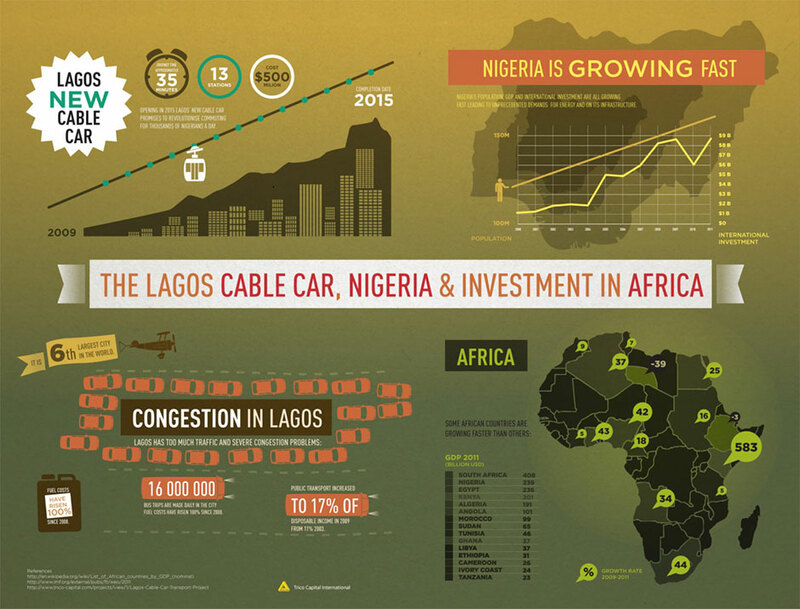 I’m not proposing we build such a large system here, and such a system would certainly cost more in Seattle than Lagos. But surely a line or two connecting our subway system to areas of potential ridership couldn’t be that bad an idea. [neighbor Ardie McLean] worries that apodments chiefly attract people without any investment in the community. 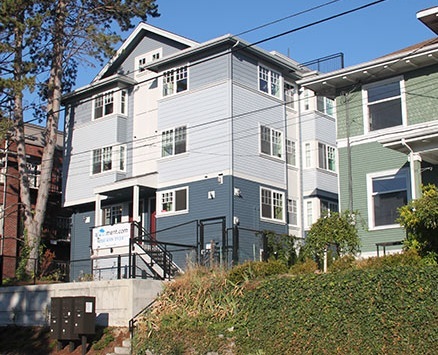 To be fair, this Snohomish rooming house will be in a single family zone, whereas Seattle’s aPodments are being built in multifamily zones. I’m strongly in favor of car-free dense housing in general in the more transit-friendly places in our state’s most transit-friendly city. But what about in the far suburbs? I’m generally not a fan of adding housing in the exurbs: they’re generally sprawled, take a large amount of resources, and require a large amount of driving both for a commute and for daily tasks. But on the other hand, I prefer to pull population toward our cities by allowing more people to live here, not by outlawing homes in the exurbs. 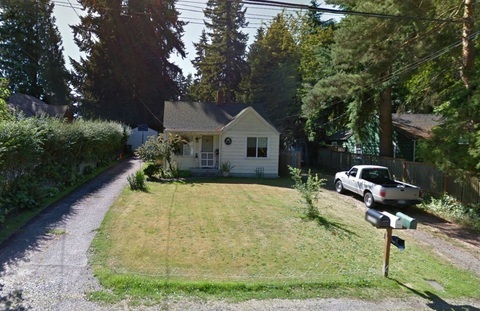 I’m having trouble imagining who would want to live in a $500 room in Snohomish, but I don’t see any reason to block the development. So what do you think. 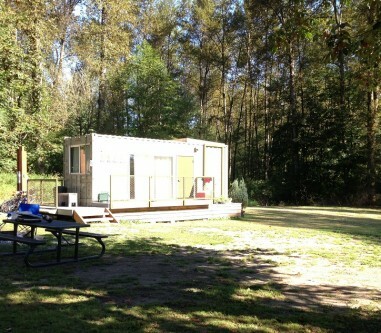 Exurban aPodments: for or against? Average commute times, WNYC map. 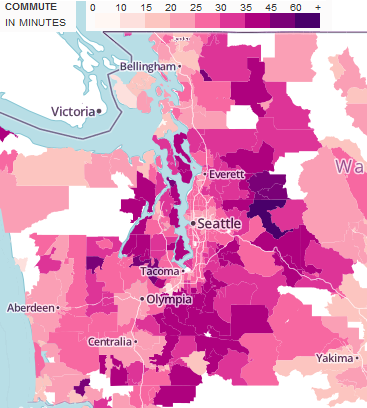 There was an excellent piece in the Slog on Monday, based on both NYU work and a US Census graphic, showing that the Seattle area both ranks 10th in longest commutes, and that we have the 3rd fastest growth for long commutes. The census piece introduced me to the term megacommuter, someone that commutes over 90 minutes and 50 miles each way. One out of every 122 full time workers in the US is a megacommuter, and 10.8 million in the US commute more than an hour each way. With so many megacommuters out there, I’ve decided to address them directly. I don’t know your situation. I can think of at least a few tragic life situations that would keep me commuting with over 20% of my waking, non-working life(1). But if you’re similar to a friend of mine that commuted this far just to have a large home, I’d like to make sure you have really thought through your choice. Let’s take a look at the money you’re spending on this commute. Looking at only tangible vehicle costs, ignoring softer numbers like the increased number of accidents you’ll be in, the cost of your reduced health from increased hours of sitting, etc., you’ll spend around $220,000 over the length of a 30 year mortgage by driving 50 miles each way(2). Now let’s look at these 15+ hours a week you’re spending commuting. If you plowed just half of those back into work by living close by, and made the median income in Seattle of $61,000, over those same 30 years you’d make an extra $229,000 after taking a third out for taxes and assuming no bonus for overtime or promotion for all of your dedication(3). But rather than working those hours you could spend time with your family, start a hobby, or go to school. Or you could take 293 extra weeks of vacation(4). Bruce’s excellent post boils down the importance of frequency. If there’s currently a long time between vehicles, cutting this time in half can shorten travel times even more than speeding up trips. However, it’s important to consider how a city or county can go about increasing frequency. Option 1: Provide more transit. In theory this is easy. Double the number of vehicles and drivers, and you cut wait times in half. Of course in the real world we often live with fixed budgets, and adding buses and drivers simply isn’t an option. Option 2: Condense service into corridors. Instead of adding service, we can remove some routes and move buses to others. This results with a set of frequent buses, but a further walk for some riders. Option 3: Speed up service. Although Bruce’s post contrasted speed with frequency, one can actually benefit the other. If a single vehicle and driver can run a route twice in the time it used to take them to run it once, then you’ve doubled not only speed, but also frequency and vehicle capacity as a bonus. As Seattle builds up a streetcar network, let’s not forget Option 3. Giving streetcars their own right-of-way, giving them signal priority, and designing the street for quick boardings can speed them up tremendously. And with this speed comes higher frequency at the same operating cost. The quick and easy trip up Yesler will be a little less quick for the next few months, starting this Saturday. Those that frequent the #27 know that construction for the First Hill Streetcar has been getting more and more involved on Yesler between 8th Ave E and 12th Ave E, and starting tomorrow this stretch of road will be closed for three weeks. However, the buses that run on this route will continue to detour until April 4. 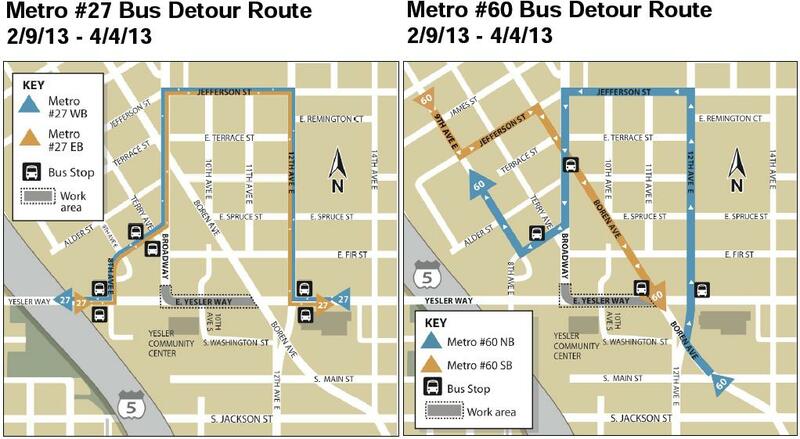 For more on the detour, visit SDOT’s First Hill Streetcar page.